In August 2014, NPR in Boston reported that scientists were training bees to diagnose diabetes. Diabetics apparently have a higher amount of acetone in their breath than do people without the illness. Bees are 10,000 times more sensitive to smell than we are, and it is thought that trained bees would be able to detect this small amount of acetone. Bees in the study were able to correctly identify patients with diabetes 70% of the time. However, the patients in this study had well regulated diabetes, and for those who are undiagnosed, the acetone would be more pronounced and easily detectable. This is an important discovery, as the test would be low cost and easily accessible for people around the world. This is one great benefit of honeybees! Similar to diabetes detection, scientists are also training bees to detect cancer from breath. 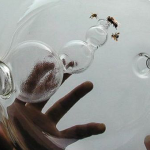 Patients breathe into a tube, and bees rush to smell the air and alert the tester. Bees reportedly can be trained within 10 minutes to detect cancer, diabetes and tuberculous, among other illnesses. When bees detect the scent researchers are targeting, they are rewarded with a sugar substance. Bees might be able to be trained to detect cancer early on when it is very treatable, making this benefit of honeybees a potential life saver. Bees have been used for years to collect environmental information, and this experiment expands on this knowledge. As bees interact within an environment, they inadvertently collect information on what types of substances they encountered along the way. 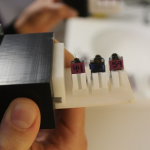 The US Department of Defense has been working on this project by attaching RFID tags to bees. The bees fly out of the hive and interact with the environment. When they return to the hive, a chemical analysis is done to detect materials used in land mines. The RFID tracks the bees every movement, allowing researchers to pinpoint where the bees picked up the chemical trace and thus locating the land mine. 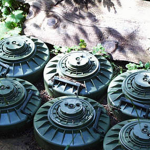 This is another life saving benefit of honeybees that could be used in countries dealing with active land mines. 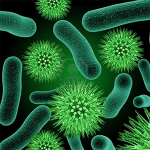 In September 2014, The Times of India released a report saying that bacteria found in a honeybee’s gut may be the next generation of antibiotics. For centuries, people have known that honey had anti-microbial and anti-bacterial properties. In fact, honey can last for thousands of years without spoiling. For this experiment, the patients were actually horses with flesh wounds that had previously been treated unsuccessfully by other methods. A topical cream, made from bacteria found in honeybees and honey, was applied to wounds on several different horses in the experiment. All the horses healed well due to the topical solution. Bee propolis has been used for years in medicine. 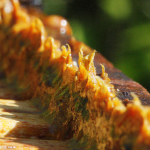 It is made by honeybees from tree resins and used to seal up the honeybee hive. It works so well, in fact, that hives have been found to be cleaner than operation rooms in hospitals. Propolis can be used for a number of reasons: similar to an antibiotic cream applied on top of wounds, treating canker sores and can even be used as a way to boost fertility. Beekeepers have taken note of this and started to sell propolis pills and creams along side honey and pollen jars.